In 1999, inspired by the remarkable success of the Human Genome Project, the OSU Libraries Special Collections launched an ambitious undertaking that seeks to closely document virtually every day of Linus and Ava Helen Pauling's lives. 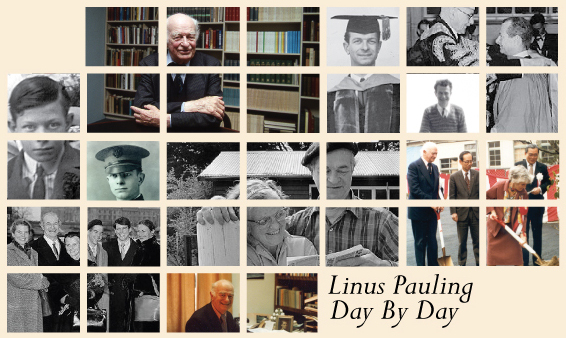 The result is Linus Pauling Day-by-Day, a constantly expanding resource that provides in-depth description for a substantial portion of the half-million item Ava Helen and Linus Pauling Papers. This huge amount of data is presented in easy-to-use calendar form. Index pages created for each year of the Day-by-Day calendar provide an overview of the major events in the Paulings' lives, a full accounting of their travel and snapshots from their various adventures at home and abroad. Within the calendar, cross-referenced summaries of tens of thousands of documents are accompanied by weekly illustrations and a growing cache of full-text correspondence transcripts. The product of all this information is a resource that provides unprecedented access to the daily activities of both Pauling as well as the many important figures with whom he communicated. To get started, click on any of the years to the left or use the search tool at the top of the page.